On a hot afternoon in August 1941, a 24-year-old Belgian woman walks into the British consulate in Bilbao, neutral Spain, and demands to see the consul. She presents him with a British soldier she has smuggled all the way from Brussels, through occupied France and over the Pyrenees. It is a journey she will make countless times thereafter, at unthinkable danger to her own life. Her name is Andrée de Jongh, though she will come to be known as the 'Little Cyclone' in deference to her extraordinary courage and tenacity. And she is an inspiration. From nursing wounded Allied servicemen, de Jongh will go on to establish the most famous escape line of the Second World War, one that will save the lives of more than 800 airmen and soldiers stranded behind enemy lines. The risks, however, will be enormous. The cost, unspeakably tragic. Her story is shot through atmospherically with the constant terror of discovery and interception - of late night knocks at the door, of disastrous moonlit river crossings, Gestapo infiltrators, firing squads and concentration camps. It is also a classic true story of fear overcome by giddying bravery. 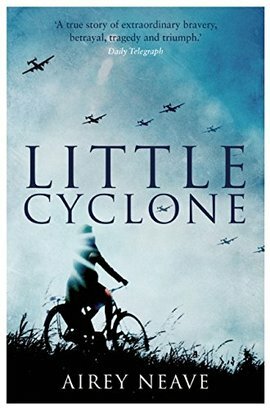 Originally published in the years after the war, Little Cyclone is a mesmerising tale of the best of humanity in the most unforgiving circumstances: a remarkable and inspiring account to rival the most dramatic of thrillers.